Ok guys, no excuses not to make this easy-peasy dessert with just 3 ingredients – chocolate, cream and eggs and a measly 207 calories per portion! Not only is it simple but it makes it into my ‘healthy eating’ category because there is no added sugar. 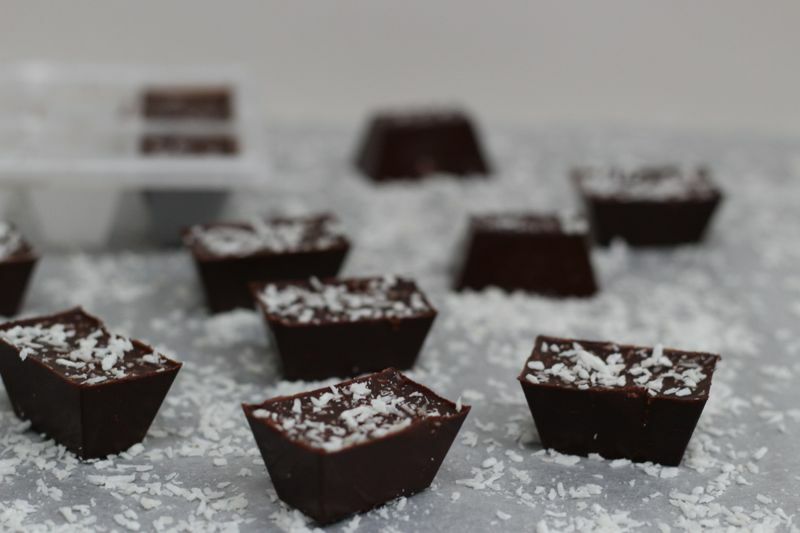 If the fact that it is super delicious, easy to make and low in calories isn’t enough to convince you to make it then the fact that dark chocolate is also good for your heart, circulation and brain should be the deal clincher! The other bonus is that this is ready after just 2 hours in the fridge. The only sugar in this recipe is whatever is contained in the dark chocolate itself. I used chocolate with 74% cocoa solids (from Lidl). 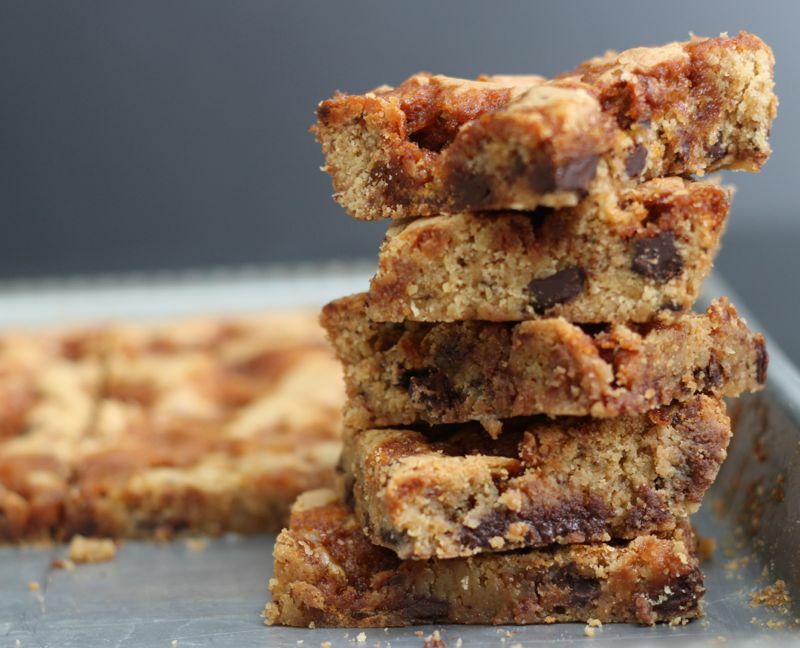 The recipe is adapted from a recipe contained in Rachel Allen’s book Rachel’s Favourite Foods. In a saucepan, bring the cream up to the boil then turn off the heat. Add the chocolate to the cream and stir until the chocolate is melted. Gently fold in the rest of the egg white, being careful not to knock all the air out. Decorate / serve as you like, with a raspberry on the top, blob of whipped cream or a little gold dust. My advice then is to hide and keep it all for yourself! 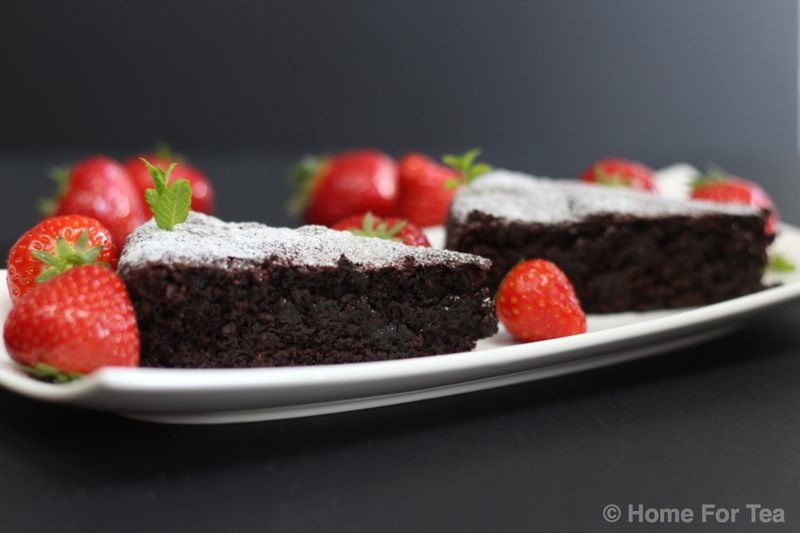 I have been dying to share this recipe with you and to urge you to give it a try – it’s delicious, moist, gooey, chocolatey flavour will beat many brownies and because it doesn’t contain any flour, it is super light. When I made this recently it disappeared so quickly I couldn’t believe it – it was voted right up there along with the Oreo Brownies from a previous post. This is saying quite something. Did I mention also how quick and easy it is to make? So what are you waiting for?! The recipe was one published by Domini Kemp in her weekly section in the Irish Times Magazine and because she said it was voted one of her most popular recipes I decided that I needed to check it out. I was not disappointed, I guarantee you won’t be either, enjoy. 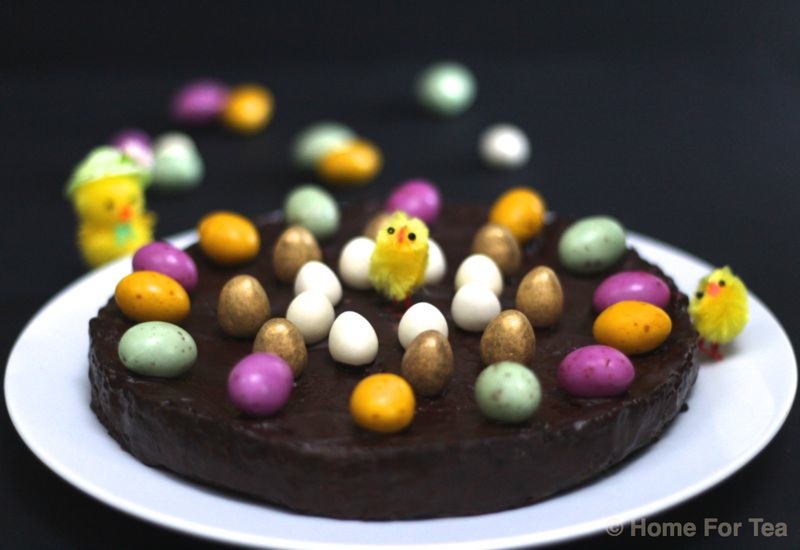 It’s Easter so it just has to be chocolate for this week’s post! This simple ‘no bake’ biscuit cake recipe is one I have adapted from a Darina Allen’s cookbook ‘Easy Entertaining’ – the cake can be made in a loaf tin or in a circular loose-bottomed cake tin like my one in the picture. The ‘cake’ is quite rich and a small slice of it is delicious with a cup of tea or coffee. 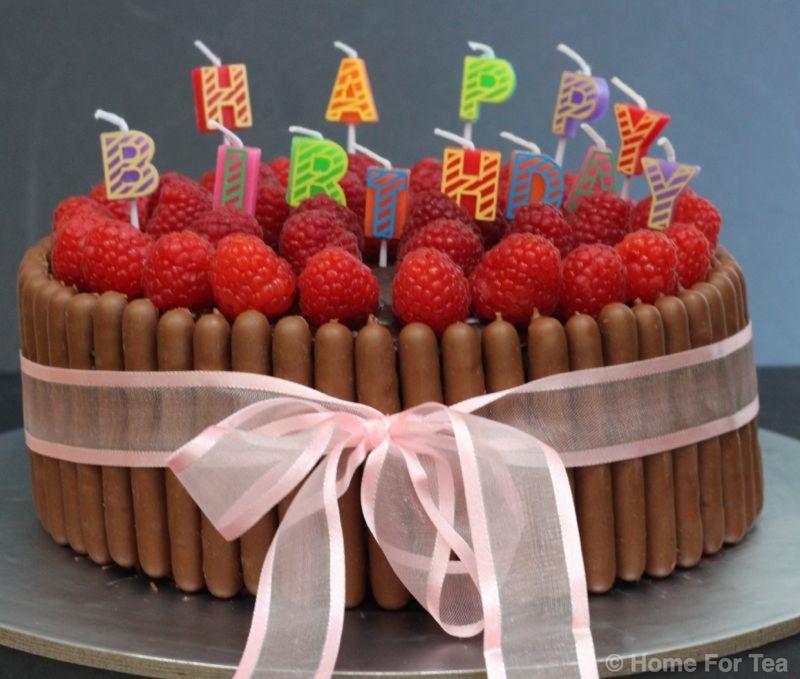 I had great fun as decorating it, the only problem now is having to wait until tomorrow to eat it! Melt the chocolate in a bowl over hot water. Melt the butter and whisk into the egg and sugar mixture while it is still hot – the mixture should thicken slightly. Add in the melted chocolate, drained raisins and vanilla essence and finally the broken biscuits and mix well. Press the mixture into the lined tin. Allow to set in a cold place until firm enough to cut. Decorate as you wish – chopped nuts, smarties, jellies …… have fun! Note: You can also make this in a loaf tin 5 x 8 inch (12.5 x 20.5cm) – top the mixture with chopped nuts before you leave it to cool. A slightly later than usual blog post this week which almost didn’t happen as I have just gone back to work after a wonderful year off. This has upset my routine (just a little!) and trying to get this dish made and photographed after a day’s work has given me a few headaches. (Think it’s a bit too soon to ask for time off during the day to take my food pics!) 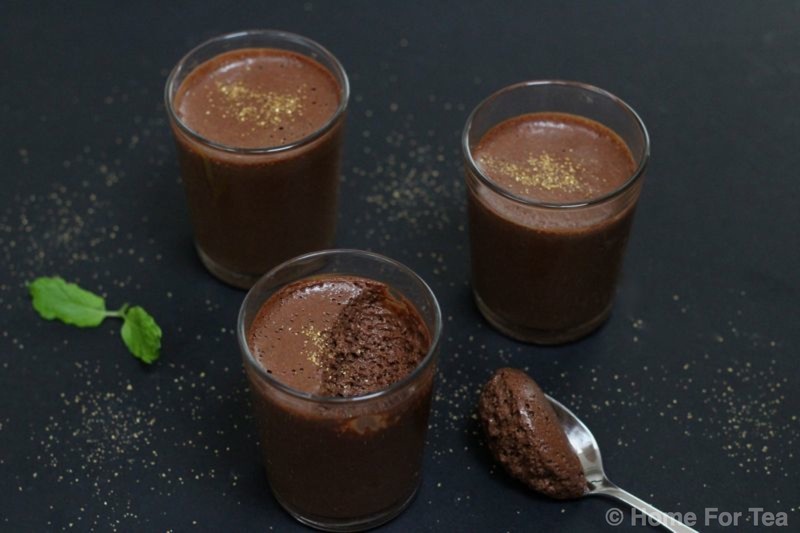 However, I just had to share this absolutely divine chocolate recipe with you – just the delicious chocolatey smells coming out of your oven when it is cooking will have you and anyone else in your house drooling and waiting impatiently to dig in when it comes out. Dark, moist, delicate, pure chocolate heaven. It is unbelievably light as there is no flour in it so gluten-free as well. I normally wouldn’t recommend sharing this under any circumstances but given the weekend that is in it share it with someone very special if you must but only if you absolutely have to! So go on and indulge yourself – a glass of something bubbly with it and life won’t get much better. The recipe is really really simple – equal quantities i.e. 150g of dark chocolate, butter and sugar and 3 eggs. That’s it! Pre-heat the oven to 160° C / 325°F or Gas 3. Grease a 20cm / 8in springform cake tin (an ordinary cake tin will work as well once it is well greased) and line the base with greaseproof paper. Melt the chocolate in a bowl set over a pan of barely simmering water, making sure the bowl isn’t touching the water. Leave to cool. Beat the butter and sugar together until pale and fluffy. Beat in the egg yolks, one at a time, then fold in the melted chocolate. In another bowl whisk the egg whites until they stand in soft peaks. Stir 2 large spoonfuls into the chocolate mixture to loosen it slightly and then gently fold in the remainder. Put the mixture into the tin and bake for 1 hour or until a crust has formed on top and there is no ‘wobble’ in the middle. The cake will rise up dramatically during the cooking but will sink once you take it out of the oven. It will also crack and this is perfectly normal. Leave to cool on a wife rack, and remove from the tin. 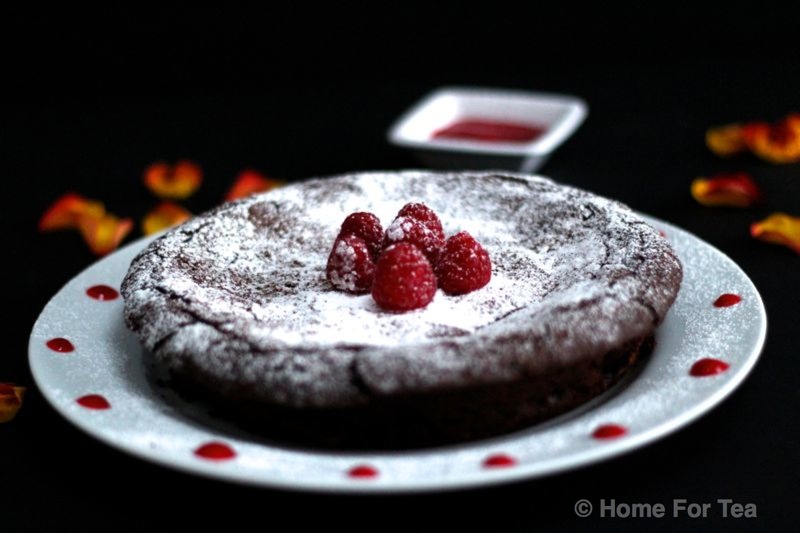 Serve the cake dusted lightly with icing sugar and cream, ice-cream, raspberries and / or chocolate sauce. Enter your email address to follow my blog and receive notifications of new recipes and posts by email.